SAULT STE. MARIE---The Escanaba Cubs may have only a .500 record, but the team seems to be peaking at the right time of the year. The Cubs carried a winning streak into this weekend's U.P. 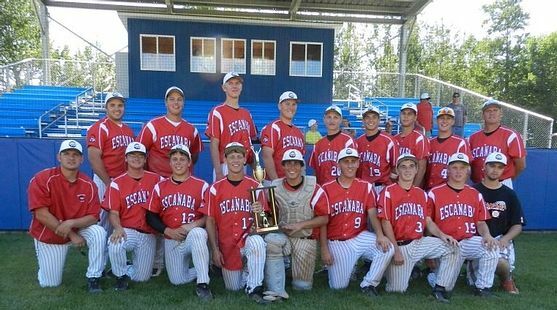 Finals in the Soo, and won the trophy, beating the Gladstone Indians, 7-6, and then topping the Kingsford Blues, 17-3. But Gladstone and Kingsford both qualified for next week's state finals along with Escanaba and the host Marquette Blues. The schedule will be posted once we receive it. Details of Saturday's games were not received as of this update. Pictured above: Cubs first baseman Ian DeMarse holds Gladstone's Paul Tomaszewski on the base during Saturday's U.P. semifinal game in the Soo. Click the thumbnails in the "ARTICLE HIGHLIGHTS" box to see more photos, taken by Kym Frazer.